I thought I had finished the production of the audio book of A Time and a Place. I had submitted the files to my publisher, who had forwarded them to Audible (ACX), only to have them rejected because they were less than 192 kbps. This didn’t make any sense to me as I was sure that I’d exported them from Audacity properly. When I checked the files out, though, I discovered that I’d actually accidentally exported a couple of files at 32 bit sample rate. It’s weird this only happened to a couple of files; why would the settings change for just a couple of files? Anyway, I figured this was the problem, so I corrected those files and resubmitted them. Audible still rejected the files. It says it’s exporting 220-280 kbps. So isn’t it? Nope! Turns out I should have selected “Constant” Bit Rate Mode, which would have resulted in a guaranteed Bit Rate of 192 kbps. Because of this mistake, I had to re-export all my files at the correct bit rate of 192 kbps. This meant finding the original sessions of each chapter. Doing so, I discovered another bit of sloppiness on my part: poor file management. I’d carefully saved each session using a specific naming convention, but I hadn’t paid much attention to where I saved the files, other than ensuring they were saved on a hard drive somewhere in, say, my house. Well, at least I knew all the sessions were saved on a hard drive attached to my MacBook Pro. Fortunately, my searches usually managed to locate the required sessions. Unfortunately, they didn’t always do so. I could not find the final sessions for about four chapters. The good news was that I was able to find and re-open at least the penultimate session for each chapter. This resulted in a bit more work than I would have liked. And I became paranoid that I wasn’t re-exporting the absolute final version of each chapter. Because of this paranoia, I decided I needed to re-listen to every second of every chapter to ensure that they were in fact the absolute final, pristine product. This cut into the writing time of my second novel, which I usually worked on during my commute, and so was a bit of a drag, but it had to be done. Fortunately, I was able to download the files from Dropbox onto my Smartphone, which meant that I could listen just about anywhere I went. Unfortunately, this usually wound up being in rather noisy environments, which meant that I could confirm the proper pacing of the sound files, and that there were no missed edits, and what the chapters would sound like in the real world, but I couldn’t really tell if there were any little clicks or pops or mouth noise etc. So I listened to all twenty-seven chapters this way, and during the course of this exercise discovered several chapters that weren’t quite up to snuff. In the case of some chapters, it was because I hadn’t been able to find and export the absolute final version, but in the case of other chapters it was because the absolute final versions themselves just weren’t quite up to snuff. By “up to snuff” I mean mostly that the pacing was off. The way I had read and edited them had resulted in readings that were way too fast. My brain couldn’t keep up listening to them. They threatened to ruin the entire product. Even if listeners couldn’t tell exactly what was wrong, what was irritating about the product, I was pretty sure that it would still bother them. All of these chapters needed to be re-edited. There were a few other minor issues too that I took the opportunity to correct, mostly sloppy enunciation, and some minor issues with the levels. If I hadn’t exported the files at the wrong bit rate to begin with, I probably wouldn’t have discovered these other issues until it was too late, so I was glad about that. Looking back, the single biggest hurdles I encountered during the production of this audiobook was the fact that I performed it myself, and did the whole thing all alone. There was nobody to tell me I was reading too fast, and I was too close to the product to realize myself where I was going wrong. I didn’t actually even clue in that there was a problem until after I’d finished recording the entire novel and completed the initial edit of the first chapter. Listening back to that initial edit, I was horrified at the pace of my read. So I re-edited the entire chapter and it was STILL too fast. It wasn’t actually until a few weeks went by and I listened to the chapter again with completely fresh ears that I was able to tell what the proper pace should be. So I edited it AGAIN and finally got it in the ballpark (I hope!). I made the same mistake with several other chapters, thinking as I was going along that I was getting the pacing right, but again I didn’t have sufficient distance to be able to tell for sure. It was several chapters before I acquired enough experience to know to insert far more space than I thought I needed. Doing so made it far easier on subsequent passes to edit the material correctly, tightening it up a bit. Had I been a seasoned performer, I would have been able to get the pacing right in the performance, which would have resulted in one heck of a lot less editing. At least one chapter (Chapter Four) was so bad that I was forced to re-record the entire chapter. But by then I had a much better idea what I was doing, resulting in a performance that was much closer to the mark, and that required only a light edit. Bottom line: it’s mostly about the performance. If you get the performance right, post-production becomes infinitely easier. I’m not saying that writers shouldn’t read and record their own novels. But I am saying that if you do, have a second set of ears present—preferably, somebody who knows what they’re doing—so that they can set you straight during the recording, which will result in a whole lot less post-production time. If you can’t have someone else present, maybe just do one section or chapter at a time. This should reduce the learning curve, and maybe by the end of the book your performance which be much closer to what it needs to be. Still, despite having created a whole lot extra work for myself on this audiobook production, I’m fairly happy with the final product. I did not release it into the wild until I was satisfied with it. I’m also really happy to have this one under my belt. With what I know now, if I ever have to do this again, it should (theoretically!) go one heck of a lot faster. But then, I have always been an optimist. 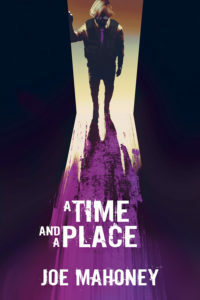 A Time and a Place, published by Five Rivers Publishing, is now available on Audible. A Time and a Place Available on Audible! Yes, highly recommended. Well, we should talk!